The ubiquitous toy of your childhood, The Big Wheel®, was first developed by Louis Marx Toys and presented to the public at the 1969 New York Toy Fair. In 2003, it was re-launched by Alpha International Inc., again at Toy Fair, to an enthusiastic response. Known over the years as “My First Big Wheel,” the Clifford the Big Red Dog™ Big Wheel® comes festooned with the familiar colors and characters seen on the popular Scholastic TV cartoon series. 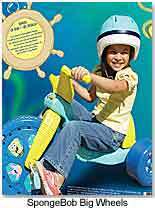 The 9-inch wheel design offers riding fun for younger children in year-round indoor/outdoor play, as does the VeggieTales™ Big Wheel®, made with the colors and decal characters seen on the Big Idea Productions TV cartoon series (both ages 1 to 3). Orange County Chopper (16"), will be released in April.